About: Nemo’s is an Italian street artist, known for his thought-provoking, dark comedy murals inhabited by characteristic human figures. He started drawing when he was very young. Thanks to his father one day he went to an exhibition of a local illustrator and this impressed him so much that from that day on he has never stopped drawing. After middle school he decided to go to an art high school named “Liceo Artistico”. In those years he began to enter the “writing” and street art work even though the street art scene wasn’t very advanced. By then he chose “Nemo” as his street-artist name, inspired by the captain from “Twenty thousand leagues under the sea”, who fought battles against the war, the injustices in the world and the silences of the sea. Nemo is also the latin word for “no one”, which makes his work even more mysterious. He added “’s”, the possessive case, because it refers to his art, so the translation goes from “no one” to “no one’s” and this completes the paradox of his way to identify himself. Nemo’s uses his characters and drawings to express himself and to release his ideas translating them into something visual that one couldn’t express with words. In his drawings the important thing isn’t really the message but mostly the pursuit of technique and emotion. Nemo’s work is divided into essential and graphic images, with a social message and made up characters that carry out poetic and surreal actions like characters in who knows which fairy tale. Where you can see it: Nemo’s is currently based in Milan, and his work can be seen in many cities of Italy, such as Sicily, Vedriano, Bologna, as well as worldwide, New York City (US), Madrid (Spain), Fortaleza (Brazil), Sarajevo (Bosnia and Herzegovina), and more. 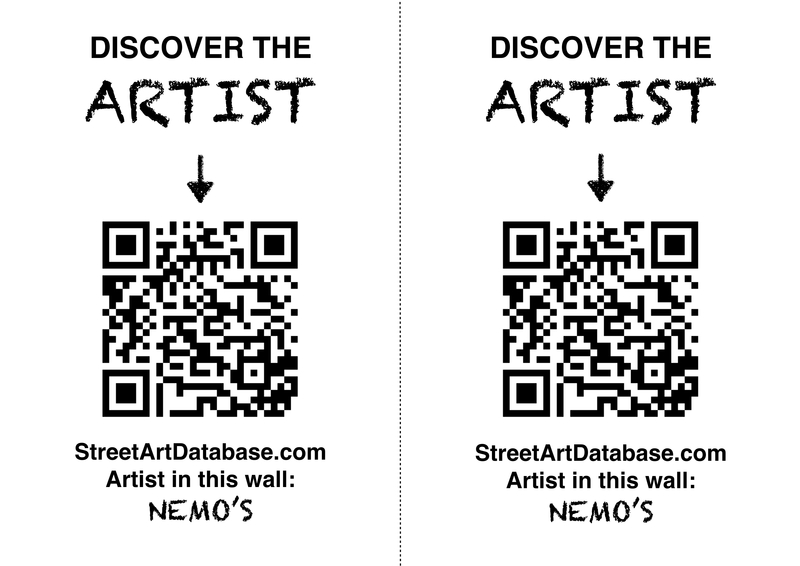 PRINT CODE: help tagging Nemo's in the streets of your city! Posted in graffiti, muralsBookmark the permalink.